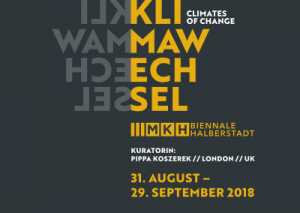 MKH Biennale is delighted to announce the full list of participating artists for Klimawechsel – Climates of Change, which takes place from Friday 31 August to Saturday 29 September in Halberstadt, Saxony-Anhalt, Germany. The third edition of the contemporary art biennale is guest curated by Pippa Koszerek. The 14 artists and collectives are: Aerocene Foundation, Alistair McClymont (UK), Aram Bartholl (DE), Georgia Brown (UK), Rebecca Chesney (UK), Jasmina Cibic (SI / UK), Eca Eps (NG / UK), Don’t Follow the Wind (JP / US / IT), Marius Förster, Kristina Fromm, Jacqueline Hen (Transformation Design) (DE), Alexander Kluge (DE), Sara Lehn (DE), Doireann Ni Ghrioghair (IE), Sogol Mabadi (IR / SE) and Sven Wiesner (DE). Opening the exhibition, celebrated filmmaker and author Alexander Kluge has created a new installation for the Town Hall’s vault, where some bombed remains of Halberstadt’s original town hall building are stored. Titled Specially made for the small miracle-cave below Halberstadt’s town hall: Triptych 2018, Kluge presents a programme of short films that contrast news and archive footage from film and current affairs with footage of animals, both in the wild and trapped in a bombing campaign. Kluge, who is from Halberstadt, has written extensively about the destruction of the town in WWII. Bringing together fiction and theory Marius Förster, Kristina Fromm, Jacqueline Hen (Transformation Design) create an immersive installation and reading room in Halberstadt Station. Apocalypse A_AP (As ________ As Posible) draws on Bruno Latour’s writing on the ecological crisis, creating a space for dialogue with the aim of finding new trains of thought. A programme of reading events will take place as an extension of this work. A public notice on a bank of the River Rother in England led Georgia Brown to embark on a durational project. The forecast: ‘In fifty years, this area will almost certainly be under water as a result of climate change’. In a new work commissioned by MKH Biennale titled Fifty Years From Now, Under the Rising Seas, the process of making a boat, to sail from river to sea, is communicated through subjective third person narrative and photographic series. In the vault of the former Central Federal State Bank two pieces by Aram Bartholl consider online privacy and our vulnerability to a new kind of heist. Forgot Your Password?Consists of eight volumes containing 4.7 million LinkedIn clear text user passwords that were hacked and circulated online in 2012. TOP25 borrows a practice developed by YouTubers to remix a series of short 3D animation logos that announce the 25 most used passwords in the world in the style of introductory sequences found on YouTube channels. With Anette Fortuna, an online-radio receiving jukebox, Sara Lehn sets the vision of a world wide public broadcast as a monument. For Halberstadt it is tuned to replay selected radio sessions on social, city and cultural politics produced by the artist since 2012. Streamers from around the world are invited to interrupt the programme with their shows, live and direct into the Biennale and make Anette Fortuna dance for the audience. Alongside a new version of his man-made tornado The Limitations of Logic and the Absence of Absolute Certainty, Alistair McClymont will create a new series of Tornado Drawings that track the movement and path of this Halberstadt tornado. Exploring concerns around water wastage, privilege and corruption, Eca Eps presents a number of works that show water in its changing states and examine its extreme capabilities as both a lifeline and weapon. Her work for MKH Biennale My Earth, Your Sea, Our Skies explores the simultaneous impact of extremism and environmental degradation. Sven Wiesner‘s large-scale clay sculptures draws attention to the process of drying out earth and the passing of life. His new commission for MKH Biennale, Fountain, continues his series of water wells and empty pools. The buckling columns and folded facades of Doireann Ni Ghrioghair‘s sculptures are cast from historic architectural features. The Deflated Capital series suggest a narrative of loss and change, becoming shrunken versions of European heritage, perhaps melted by extreme heat or decades of dilapidation. In 2015, the curatorial collective Don’t Follow the Wind staged an ongoing inaccessible exhibition inside the exclusion zone surrounding the Fukushima Daiichi Nuclear Power Plant. Material Witness is an installation comprised of everyday objects found at these exhibition sites that have born witness to the processes of contamination and entropy. These marked objects travel outside of the zone along with the photographic evidence of their origin, acting as living symbols of the ongoing catastrophe. Future Kit is a developing series of artworks by Rebecca Chesney that look at how we make, often futile, attempts to measure and protect ourselves from future climate weather extremes. The works were developed through meetings with scientists at NASA and include Flood Stick – a measuring device for those living in areas at risk of flood and the disturbingly apocalyptic Future Mask, aimed to protect against dust particles, water, oil based mists and sunburn. Jasmina Cibic‘s work draws a parallel between the construction of national culture and its use value for political aims, encouraging the viewer to consider how changing fashions in state architecture and art collections are a reflection of ideals and politics of their times. Exhibited within the old registry office of Halberstadt’s former Town Hall, the mirrored décor of this official chamber echoes the architectural spaces and bureaucratic aesthetic of Cibic’s two films Fruits of our Land and Framing the Space. Fittingly, the building now forms part of Harz University of Applied Sciences (Hochschule Harz), a school which trains secretaries, administrators and future council officers. Sogol Mabadi will create a new performance behind the scenes of St Stephanus Cathedral. Taking place between 1-5pm on Sunday 9 September, Mabadi explores ideas around care and human connection within the hidden room behind the cathedral’s historic organ. The closing weekend of MKH Biennale will see the launch of Museo Aero Solar in Halberstadt, an open global project from Aerocene Foundation. Every Saturday throughout the biennale, a drop-in workshop will take place outside the MKH Office where members of the public can bring used plastic bags and participate in building this flying museum that will become airborne using the power of the sun. On Saturday 25 August, MKH Biennale will stage the first live performance of the Museo Aero Solar at the Lyonel-Feiniger-Gallery Museum of Graphic Art in the nearby town of Quedlinburg. MKH is a biennale born from a desire to nurture a conversation around contemporary art within the town of Halberstadt, developing the whole city as a cultural space and resuscitating unused sites. It is led by the not-for-profit organisation Monat_Kunst_Halberstadt e.V. The inaugural biennale in 2014, Contemporary Menagerie of Visual Philosophers was curated by Halberstadt and Sussex-based artist Ilka Leukefeld and featured 10 artists, including Alexander Kluge (DE), Dean Kenning (UK) and Justine Blau (LU). The 2016 edition, titled “What will be… from now on?” was conceived by curator and art journalist Dr Peter Funken and featured 12 artists including Peter Puype (BE), Mariana Vassileva (BG) and Silvia Lorenz (DE). Halberstadt is a town of over 43,000 inhabitants in the Saxony-Anhalt region of Germany, situated near the Harz mountains (famously depicted in the works of Caspar David Friedrich, Johann Wolfgang von Goethe and Heinrich Heine). The town attracts a regular flow of international visitors to the John Cage Organ Project and to visit the town’s many church organs (the town is known to have the oldest documented pipe organ, dating from 1361). Pippa Koszerek is an artist, writer and curator based in London. Pippa has been involved with artist-led activity since 1999 when, as a student, she founded the Independent Art School in Hull. In 2008 she initiated POST, a uk-wide network for artists and curators involved in site and context responsive practices. Past curatorial projects include Construction Gallery, London, Island Projects at the Dickens Museum, London and PRESS ROOM, a special project at the Creative Time Summit, Venice Biennale 2015. She regularly writes for a-n News.